Wrecker services are working overtime in wake of Tuesday's storm, picking up damaged cars and getting them to body shops in cities such as Frisco. "They're asking us if we're open and once we say yes, they say, 'Well we're on our way,'" said Jason Brassfield at Herb's Paint and Body. The northern part of the Metroplex -- Grayson, Collin and Denton counties -- is still digging out from the Christmas Day storm, which could possibly linger for the rest of the week. Wednesday's sunshine began the meltdown, but temperatures remain cold enough that many of the areas are refreezing. And the biggest problem areas Wednesday night were side streets and neighborhoods that did have any trucks plowing or spreading materials to improve traction on the roads. While kids flock to Flagpole Hill to slip and slide, others take the freezing temps in stride. 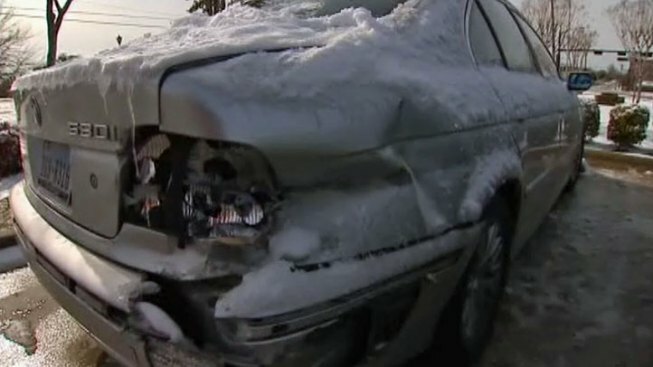 The current volume of wrecked cars may only be a precursor of what's expected in coming days as more drivers hit the roads in areas that received as much as 6 inches of snow. "When you factor in the volume of the cars coming in compounded with the holidays -- you know, a lot of these vendors shut down -- it becomes harder to get parts," said Ron Grafflin at Service King. "With the influx of cars, we may have a lot of cars here for a month."